If you're in a wheelchair, you don't need to give up on the idea of taking part in sport. There are plenty of opportunities for wheelchair users to participate in sports like five-a-side football, archery, badminton, tennis, table tennis and bowls. Most of the time you'll be playing alongside other people who are in the same position as you, so your wheelchair won't put you at an immediate disadvantage. You can join Wheelpower, which is the national charity for wheelchair sports in the UK. It is committed to helping wheelchair users participate in wheelchair sports. The charity offers impressive sporting facilities at the Stoke Mandeville Stadium in Buckinghamshire, which has been dubbed "the home of Wheelchair Sport". Here you will find an Athletics Arena, Sports Hall, Swimming Pool, Fitness Centre and Indoor Bowls Centre. If the facilities are too far away for you to travel to and from the centre in the same day, you can stay in the Olympic Lodge or the Olympic Village. Archery - Get in touch with your local archery club. They can offer you the initial basic training, after which they can arrange for you to attend a training weekends (usually over the course of six weekends) to get coaching from more experienced archery coaches. The Archery Association is involved in several archery competitions, including the annual indoor tournament and the British Wheelchair Sports Foundation Junior and Senior Games and Championships. Athletics - Contact the British Wheelchair Athletics Association. They can arrange for you to attend a training weekend at the Stoke Mandeville Stadium. If you want to take your participation in the sport to the next level, Grand Prix events are held on a regular basis during the summer months. Basketball - Contact the Great Britain Wheelchair Basketball Association. You can join one of sixty-five basketball teams, who are spread across nine divisions. Bowls - Contact the British Wheelchair Bowls Association (BWBA). They have regular meetings at the Stoke Mandeville Stadium and use the facilities there. There are several coaching weekends at the centre. In terms of competitions, there are the National Wheelchair Championships, the Home Countries Bowls Tournament (annual) and the BWBA Matchplay event. Fencing - Get in touch with the British Paraplegic Fencing Association. Hand Cycling - This sport involves using the hands to power the equipment instead of the feet. Contact the Handcycling Association of the United Kingdom. Power lifting - Contact the British Weightlifting Association for the Disabled. Rugby - Contact the Great Britain Wheelchair Rugby Association. Shooting - Contact Disability Target Shooting Great Britain. Snooker - Get in touch with the British Wheelchair Cue Sports Association. Coaching weekends take place at the Stoke Mandeville Stadium. Competitions held include the National Junior and Senior Championships and the Inter Spinal Unit Games. You can play against able-bodied players, as well as other wheelchair users. Six ranking tournaments provide the basis for the British rankings, which are used to determine how can represent Great Britain in European and World Games. Swimming - Contact the Association of British Swimmers. Table tennis - Contact the British Wheelchair Table Tennis Association. You can play against able-bodied opponents if you want to. 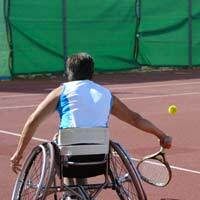 Tennis - Get in touch with the National Wheelchair Tennis Association. Are Wheelchair Sports Different to 'Normal Sports? There is obviously some degree of difference, especially with sports like football and tennis, as an able-bodied personal would be connecting with the ball in an upright position whereas in wheelchair sports, this is clearly not going to be the case. Because of this, wheelchair sports are not as physical and extreme, as the game needs to be played whilst in the wheelchair. Having said that, wheelchair sports are every bit as competitive as the able-bodied disciplines, and competitors are no less skilled, particularly at the highest level. How Competitive can I be? You're not automatically relegated to amateur sports just because you use a wheelchair. Many of Britain's top athletes compete in the Paralympics (the disabled version of the Olympics) with huge success.